- past ideologies are not the solution, we need a sound, pragmatic approach, and a restoration of economics as it ought to be defined**: not the science of wealth, but the comprehension of a system or an activity, be it an individual, a society, a company, a living organism... Again, "we shall win over nowadays depression only by opening ourselves up to economy, not by trying to elude it because we forgot what it means for the future of this planet". Again, finance is a means, not an end. Again, no equation is relevant if it doesn't consider humans and the environment. Of course, business and economics should be taught accordingly. 50+20 Agenda: Management Education for the World - Launch Video (720p). The Republic of Korea is under attack. From within. 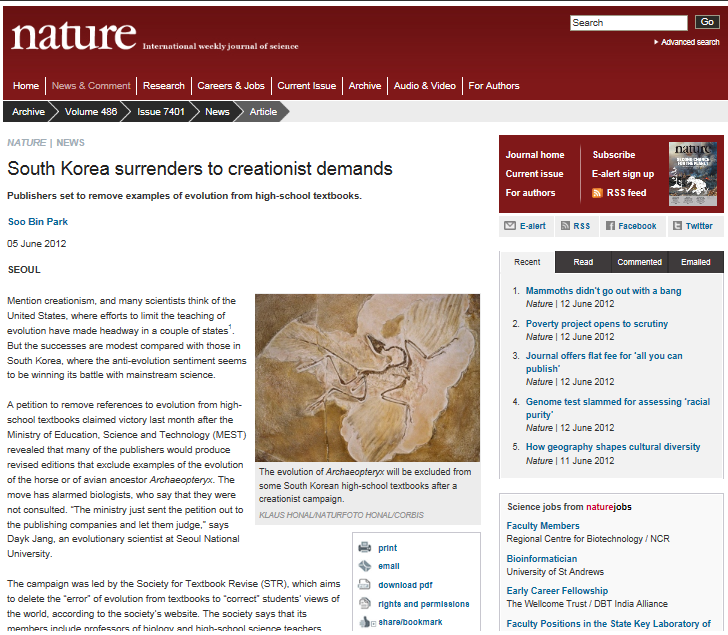 After the shameful termination of the Truth and Reconciliation Commission Korea, and after the flabbergasting removal of history from school curriculum, yet another outrageous victory for revisionists in Korea: the Ministry of Education, Science and Technology gave in to a Creationist lobby, and made possible the publication of high school texbooks where examples of evolution have been removed. Letting Creationism, the very negation of science and education and one of the worst enemies of democracy, dictate the contents of textbooks is undoubtedly the most profound disgrace imaginable for any Ministry of Education. But here in Korea, that's the ultimate abomination. This is Korea, the country of King Sejong, a wise statesmen who advocated education and science. This is Korea, a country victim of revisionist texbooks in Japan, where the extreme right, though very small in members, has considerable power over national politics and manages to keep the whole population in the dark regarding the country's troubled past. 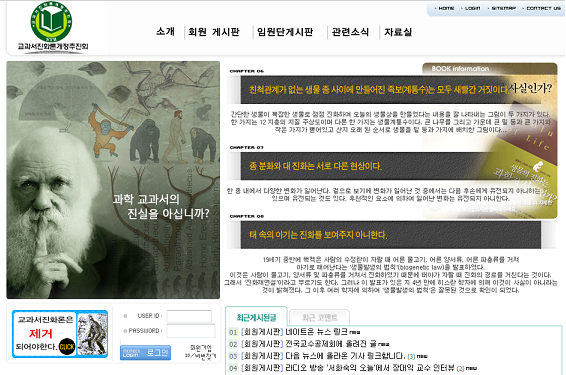 Once again**, it seems that Korea is under attack from its worst enemies, the ones from within. A minority of extremists who dream of copying the Japanese "model" and to rule over the past and the future of the country. And once again, these impostors are not nationalists: they want the destruction of Korea as a republic and as a democracy, and they are the best allies of the impostors who, in Japan or in China, multiply the same kind of provocations to fuel mutual hatred and extremism across the region. Across the aisle, true Korean nationalists, true partisans of democracy and of the republic must defend the nation against the impostors who try to destroy it: expose and condemn their impostures, prevent revisionist textbooks from being published, and restore the values that make Korea a great country. * Of course, "creation" and "research" are antinomic, but precisely, the whole concept of creationism is an insult to science and education. If believing in a creator is perfectly respectable, "Creationism" is pure forgery, an imposture that has nothing to do with science, and even nothing to do with religion: the agenda is political and ultimately, it's about replacing democracy with theocracy, and about replacing religion with fundamentalism. ** They seem to grow bolder by the day, and the multiplication of such provocations (see recently MBC's xenophobic video - "Still no apology from MBC, and more provocations on the Chinese front") is probably not a coincidence in this election year.